WAVE-PARTICLE DUALITY Page about wave particle duality. THE ELECTRON All about the humble electron. X-RAYS X- rays and the electromagnetic spectrum. 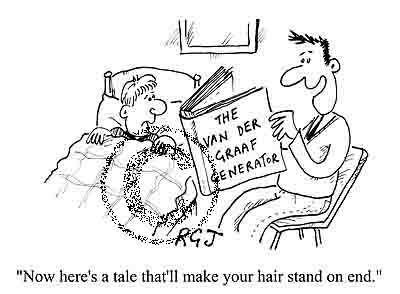 http://www.amasci.com/emotor/vdg.html All about the VDG generator. http://www.sns.gov/projectinfo/operations/training/lectures/DTL_101.pdf A 17 page document on how a LINAC really works…..too difficult and unnecessary reading, but interesting. http://hyperphysics.phy-astr.gsu.edu/hbase/magnetic/cyclot.html The cyclotron and how it works. http://science.howstuffworks.com/atom-smasher.htm Basic overview of ‘atom smashers’. http://www2.slac.stanford.edu/vvc/accelerator.html good overview of particle accelerators. Especially the SLAC. http://www-elsa.physik.uni-bonn.de/Informationen/accelerator_list.html List of accelerators around the world. http://public.web.cern.ch/public/ CERN….will we get a trip there in 2005? FERMI LAB Visit the Fermi accelerator lab.